These days, if you find yourself daydreaming about running away to an exotic island, it may help to know you’re not alone. Designers this summer are in a vacation state of mind and tropical jewelry is the latest incarnation of fashion escapism. Whether it’s a direct result of the current news cycle or just the natural progression of warm weather-themed trends is hard to tell, but there’s no denying the uplifting effect of palm trees, flamingos and bright, cheery flower motifs. 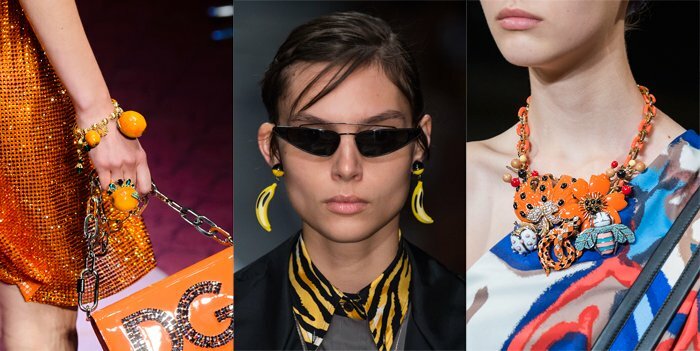 We first noticed the trend on the Spring 2018 runways of everyone from Prada and Dolce & Gabbana, who treated audiences to an array of fruity baubles, to Sachin & Babi, Isabel Marant and Marc Jacobs, who offered up punchy tassels, florals and colorful critters. Now the tropical jewelry trend has trickled down and Zara, BaubleBar and a slew of other retailers are offering a chance to get away — even if you can only afford a staycation. Ahead, scroll through 14 tropical jewelry picks that are guaranteed to lift your mood without you having to leave the house.